If you are in seminary or thinking of going, Michael P. Jensen has written a book that you need to read. 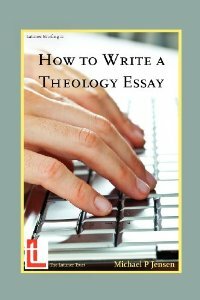 It’s called How to Write a Theology Essay, and it will only benefit you as you prepare for the task of serious theological writing. Jensen teaches at Moore Theological College in Sydney, and in this book he has summarized countless conversations with students on crafting and composing a solid theology paper. The focus is on the theological writing in general, but it could be easily applied to biblical studies or historical theology with minimal adjustment. I wish I’d had a resource like this before beginning seminary. Jensen covers a number of topics about which I asked professors as I worked on papers for their classes. Many of the issues he covers were ones I simply had to learn the hard way or figure out by looking at model papers. If you read this short book before you get started or while you are still in your theology degree, it will save you a lot of trial and error time. Read it now to save yourself a lot of guesswork. All the chapters are practical and full of important tips. Especially helpful were the chapters on analyzing questions, how and what to read, advice on quoting, and different types of argumentation. Read and re-read the chapter on how to treat your opponents. The book is bound together in that all of the chapters are working to help you move beyond summary work to engaging in the higher learning skills of evaluating, synthesizing, and analyzing, which are essential to balanced and critical thought. This book is also important because, in my experience, there was not a great deal of instruction on how to write a paper in seminary. It is generally assumed that graduate students in the humanities know how to write a research paper. But seminary is something of a different bag. Many students who come to seminary don’t have a background in the humanities. They may have math, science, or engineering backgrounds and, having experienced a call to ordained ministry, decided to go to seminary. Sadly, even many students who come out of a humanities undergraduate program are still quite weak on their writing. Jensen’s book will help you through the challenges and get you up to speed on how-to matters that your seminary profs will expect you know. This book will only help you learn to communicate more effectively and elegantly. It is a witty and humorous read that you will want to keep around for consultation. You will not be disappointed. What has been your experience with paper writing in seminary? Do you feel well-prepared or under-prepared for the task? If you have finished seminary, what do you think about as you look back at paper writing? Did you find it important? If so, why? If not, do you think more instruction on writing a good paper would have made the exercise more productive?